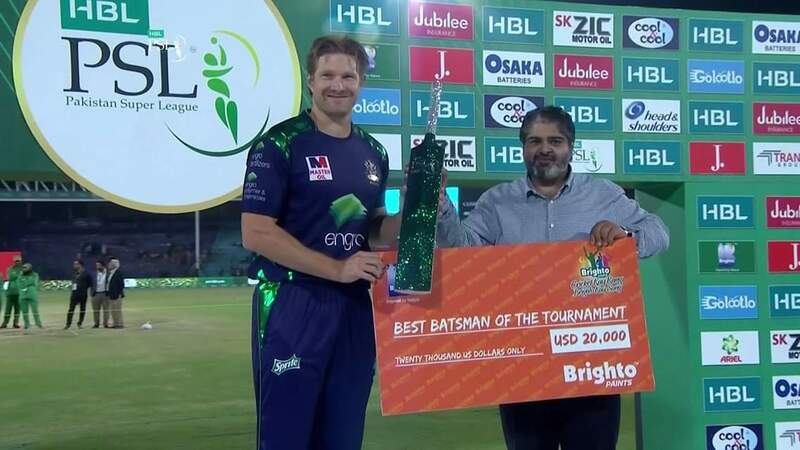 Karachi: Shane Watson of Quetta Gladiators was named as the Player of HBL PSL 2019 after the 2007 World Cup winner with Australia finished as the leading run-getter in the 32-day tournament, which culminated at the National Stadium on Sunday. Watson finished the series with 430 runs from 12 matches at an average of 43 and a strike-rate of 143.8. He clubbed most number of fours and sixes in the tournament, 43 and 22, respectively. Watson won player of the match awards against Islamabad United, when he scored 81 not out, Peshawar Zalmi, when he scored 91 not out, and again versus Peshawar Zalmi in the Qualifier, when he top-scored with 71 and then bowled the crucial last-over of the match to help his side win by 10 runs. Watson, for his consistency with the bat and proving to be one of the decisive factors in Gladiators’ title-winning campaign, was also declared Brighto Best Batsman of HBL PSL 2019. Hasan Ali of Peshawar Zalmi was adjudged the Go Lootlo Best Bowler of HBL PSL 2019. The fast bowler picked up crucial wickets and finished the series with 25 wickets at an average of 13 with an economy-rate of just under seven. Hasan took four wickets in a match three times. Luke Ronchi won the Jubilee Safe Hands of HBL PSL 2019 award when he dismissed 11 batsmen behind the stumps, while Peshawar Zalmi’s Kieron Pollard was declared the ARIAL and J. Best Player on the Field, when he finished the series with 284 runs, five wickets and 10 catches. Karachi Kings’ left-arm spinner Umer Khan was named as the newly introduced Emerging Player of HBL PSL 2019 award. The 18-year-old mesmerised the top-order of all the sides and claimed 15 prized scalps at an economy-rate of just over 7. Islamabad United was declared the winner of Cool & Cool Spirit of Cricket award, which they dedicated to their middle-order batsman Asif Ali in recognition to this commitment to the team despite the ailment of his young daughter. The individual winners were chosen by an independent panel, which included Mudassar Nazar (Chairman, Event Technical Committee), and also comprised respected commentators Ramiz Raja and Danny Morrison.